Some of the most effective treatments for bipolar disorder reported by patients are not drugs, according to a new study by CureTogether, a free resource owned by 23andMe that allows people to share information about their health and treatments. People in the study said they found that lifestyle changes like exercising, reducing alcohol intake, and having a defined sleep schedule were the most effective. The exception, according to those surveyed, was the drug Lamictal. Conversely some popular treatments such as Prozac, Wellbutrin, and anti-depressants in general, were among the least effective, according to the study. These are all treatments suggested and reported by patients, so some redundancy in the terms used is to be expected. In addition, the term “treatment” in this study refers to anything patients describe using to help them feel better whether it is an offically prescribed medical treatment or not. More than five million Americans are affected by bipolar disorder every year, and two-thirds of people with this disorder have at least one close relative with the illness or with major depression – evidence that the disease has a heritable component. Finding treatments that work well can be a challenge, so CureTogether asked people suffering from Bipolar Disorder to rate the effectiveness of different treatments. 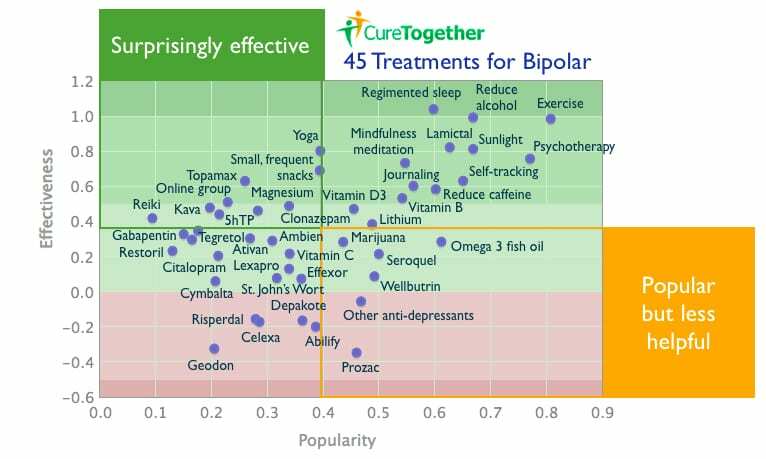 CureTogether’s study compiled responses from 301 people with Bipolar Disorder, who rated the effectiveness of 45 different treatments. Among the most helpful treatments were yoga, mindfulness meditation, sunlight, and the drug Lamictal. Also highly effective for those in the study were journaling and self-tracking. The people in the study also said that Celexa, Abilify, and Risperdal – all prescription drugs – were not as effective, and were reported to actually make the condition worse. Where did this data come from? This is the result of a four-year CureTogether study on Bipolar Disorder, in which people living with the condition shared information about their symptoms and what treatments worked best for them. We’d like to thank those who participated. And just as they shared their experience with treatments, we’re freely and openly sharing the results of the Bipolar study. Please tweet, blog, or pass this along to anyone who can benefit or is interested in Bipolar Disorder. Thank you!